So I've been working on my daughter's room for awhile now adding bits and pieces as I can or get inspiration. When I started it I new I wanted something that was bright and fun. It's still a work in progress and there are things that I want to change like her bed frame, but it was free and it works :) But I wanted to share the flowers that I made for her walls. I cut all the shapes out of vinyl by hand and with my Cricut (most shapes came from accent essentials cartridge). Some of the shapes were meant to be flowers and some I combined and and layered to make flowers. The circle leaf stem is actually a border design and the rest of the stems and leaves I cut by hand. I first mapped it out by drawing a sketch of how I wanted it to look and choosing which colors I wanted to use where. Then I cut them and used transfer paper to put them on the wall. It was super easy especially with my mom's help to keep my girls entertained while I worked on it. Also my mom had all the vinyl on hand and was so nice to give it to me for FREE! She's fabulous I know! It's such a fun room to be in and both girls love playing in there! Enjoy! The leaves in this picture are little strips of vinyl. I light drew the leave shape on the wall and then cut each strip and stuck it on there. This flower is one that I used different shapes to create the shape of a flower. I had to stick each little piece of vinyl on by hand...time consuming, but worth it! This one I also did all of it by hand. I started with the flower shape and added the polka dots and trim around the edge. Hi Marie. It's so lovely to meet you and find your gorgeous blog! It looks like you have a real flair for decorating so I can see I'm going to enjoy reading your posts. Thanks for following me-I'm thrilled to following you now too! first time here...love ur space.. It looks so cute. I am just curious - what cartridges did you use for the vinyl flowers? Oh my! Lovin' it! You did an awesome job! Darling!! Been working on my now one year old's room FOREVER, but am adding these beauties now too ;))) Thanks for sharing!! great job! I love the flower patterns! Very cute! I love the colors you used. My daughter would love this in her bedroom. so pretty! What a lucky girl to have such a cute room! what an amazing project. everything looks so perfect, i'm sure the little one loves it! those are so much fun, i love the big flowers and how bright the room is! I am a big fan of bright colors! How cute is this room?! Awesome job! This is so beautiful, I just love it!! Now I'm ready to go re-do Little Miss' room, LOL!! (Hopping over from a linky party). Cute! I bet she loves it! Cute room! I am following you back! Hopping over from Ladybug Blessings linky party…. Looks AMAZING! 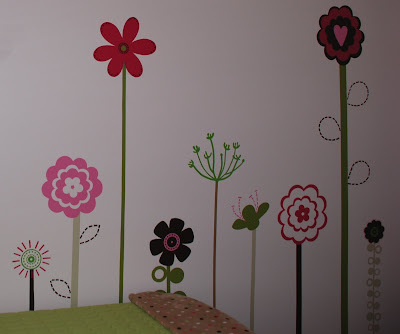 Perfect for a little girl's room. What a lucky girl!! This is the cutest room ever. Hopped over from iheartnaptime. I think this is to cute. Just pinned it. Wow! What an amazing blog! I just finished my first piece of furniture and about to reveal it this week :) can't wait to peruse through your blog. I'm following you now. Adorable!! The flowers make the room so beautiful. Great job done. I am sure your daughter must be enjoying it. I am hosting my first link-up party - Tea Time Thursdays @ Kreative Korner. Would be glad to see some of your awesome posts there. Hope to see you at the party. I love these flowers! I have something similar for my little girls room! Just on a smaller scale! But I love love love the big flowers! Such a pretty and happy space! Your daughter is a lucky girl! I'm sure she loves this beautiful room. Thanks so much for showing it to my readers at the Fab Friday linky party. I love the flowers and when I showed my daughter she said she wanted some for her room. Her name is Violet so she's always been surrounded by flowers :) Where can I buy vinyl?